Age 88, of Center Twp., peacefully surrounded by her family on Sunday, September 16, 2018. Born July 14, 1930 in Bristoria, PA to the late James and Dora Hughes Nelson. Wife of the late Jack H. Wood; daughter-in-law of the late Ray and Lucy Wood. Loving mother of Bob (Nancy) Wood of Baden and Susan (her late husband Marvin “Mars”) Turley and dear friend the late Richard Steward of Monaca; grandmother of Brandy (Bill) Campbell of Wexford and Marvin Turley, Jr. of Aliquippa; great-grandmother of Zoe and Lola Campbell of Wexford. Sister of Judy (John) Hoge, Joe (Connie) Nelson, Vivian (the late Ed Wood) Renshaw, the late Jerry (surviving spouse Helen) Nelson, Lucy (Albert) Wilkerson, Eileen (Chuck) Wood, Don (Rita) Nelson, Jim (Dorothy) Nelson and Clara Lou (Snowball) Zollars and Marjorie (Jim) Wise; also survived by her; sister-in-law of Carolyn (the late Bill) Grimes, nieces, nephews and cousins. 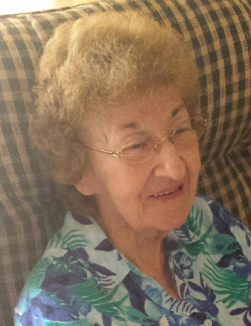 Jackie was an avid Steelers and Pirates Fan, enjoyed gardening, flowers, baking and cleaning. She also loved spending time with her family and neighbors. Friends received Wednesday 4-8 PM in DARROCH CREMATION AND FUNERAL TRIBUTES, INC., 2640 Mill Street, Aliquippa (www.darrochfuneralhome.com) where Funeral Service will be held Thursday 11 AM with Rev. Deborah Huffmyer officiating. Entombment will follow in Woodlawn Cemetery. In lieu of flowers, contributions in Jackie’s memory may be made to North Branch Presbyterian Church, 139 North Branch Rd., Monaca, PA 15061 or the Alzheimer’s Association, 225 N. Michigan Ave., Fl 17, Chicago, IL 60601 (www.alz.org).